On the 4 July 2016, Talk Real was in Paris, for the summit of the EU-Balkans Civil Society Forum. 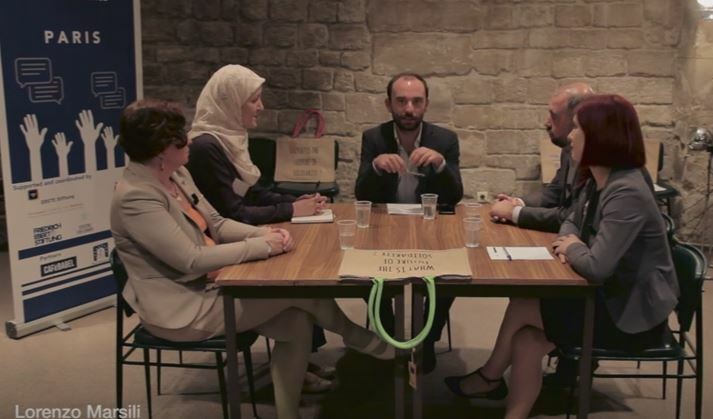 Hosted by Lorenzo Marsili, the talk show engaged four participants in a discussion on the future of civil society and solidarity in the Balkans. They were: Dane Taleski, PhD in Political Science and Researcher (Macedonia); Dona Kosturanova, president of Youth Educational Forum; Meliha Bajramovic from the Civic Plenum Zenica (Bosnia and Herzegovina) and Móra Veronika, from the Òkotárs Foundation (Hungary). Addressing issues such as the background and the legacy of some social movements (for instance, the Colourful Revolution, in Macedonia, and the plenums, in Bosnia and Herzegovina), the talk show also analysed the European prospects and influence in the countries. The theme is especially relevant now that the European Union is facing an unprecedent crisis, in the aftermath of Brexit. As Lorenzo Marsili puts it himself, “we should not be discussing when the Balkans will join the European Union, but how long we have for the European Union not to 'balcanise'". Talk Real is an initiative by European Alternatives, “a transnational membership organisation promoting democracy, equality and culture beyond the nation-state”. The talk show has been piloted since the summer 2015, in collaboration with studio Piroetta, in an informal but professional audiovisual structure. It seeks to provide room for members of the civil society to discuss and explore topics in depth, engaging guests with the most diverse backgrounds, from intellectuals to cultural workers and activists. Proposing “direct action in the real world”, it has invited speakers from all over the world, among them Gilberto Gil (Brazilian singer and former Minister of Culture), Yanis Varoufakis (former Greek Minister of Finances) and Luciana Castellina (European MP and one of the founders of Il Manifesto). The programme has been hosted and shot in several locations worldwide, under the direction of Berardo Carboni.